Want to celebrate Saint Patrick’s Day Italian style? Have you ever eaten traditional Shepherd’s Pie? We find that it is often pretty bland with a lack of seasoning. Sometimes it is even a little dry. When we found this recipe for Italian Shepherd’s Pie we got very excited! Now we can eat what looks like a traditional Saint Patrick’s Day meal with an Italian twist. 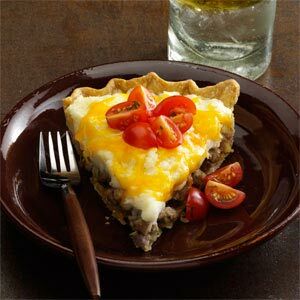 Add some Italian sausage instead of ground beef, add some parsley, oregano, and tomatoes and you have an Italian Shepherd’s pie. Play around with this recipe and see if you can make it even better. After all Saint Patrick was Italian! Line unpricked pastry shell with a double thickness of heavy-duty foil. Bake at 450° for 7 minutes. Remove from the oven and remove foil; set aside. Reduce heat to 350°. In a large skillet, cook sausage until no longer pink; drain well on paper towels. Place ricotta cheese and egg in a blender; cover and process until smooth. Transfer to a large bowl; stir in potatoes, sour cream, oregano, salt and pepper. Place sausage in pastry shell; top with potato mixture. Drizzle with butter. Bake for 50-60 minutes or until a thermometer reads 160°. Sprinkle with cheese; let stand until melted. Garnish with tomatoes tossed with minced parsley if desired. Yield: 6-8 servings.